I'm a huge fan of bath bombs and bath oils, but really hate having to scrub the bathtub clean afterwards, completely popping my relaxed state of mind. That's why the range from Mimic are my favourite, as even with their bold, bright colours and flakes of glitter, it just takes a quick ten second spritz with the shower head to remove any evidence. Also all of their products are Sls-Free, Paraban-Free, Cruelty-Free & Vegan. Their Halloween collection this year has an excellent range, including frothing cauldrons perfect pumpkins and even tiny child sized options for smaller soaks. However it was the larger, brighter ones which caught my eye, so I've been excitedly waiting to use the Ghost Bath Bomb (£3), Skull Bath Bomb (£3.95) and the gigantic Tombstone Bath Bomb (£4.50). 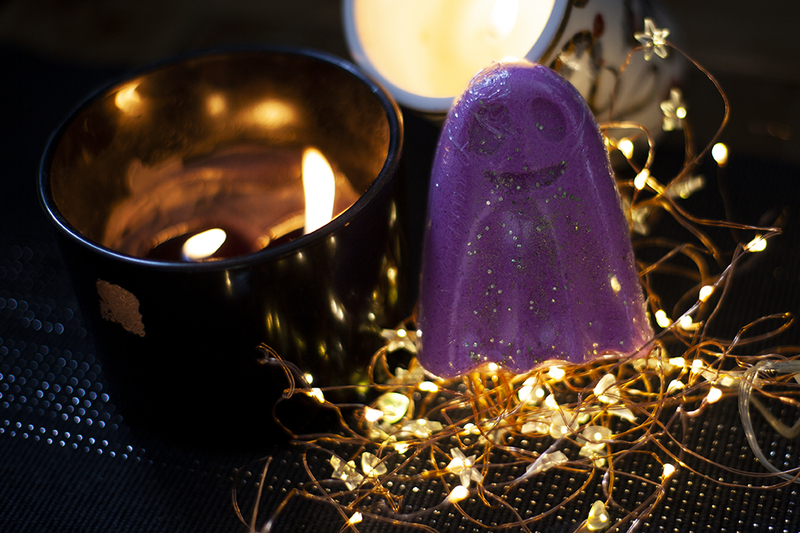 The Ghost Bath Bomb (£3) is adorable. Available in three colours with pink having a candy crush scent, blue being blueberry cheesecake and the white one bringing all the boys to the yard with a strawberry cheesecake smell. He has a hidden centre which reveals a second layer of colour when fizzing, and is a really pretty sight to behold. 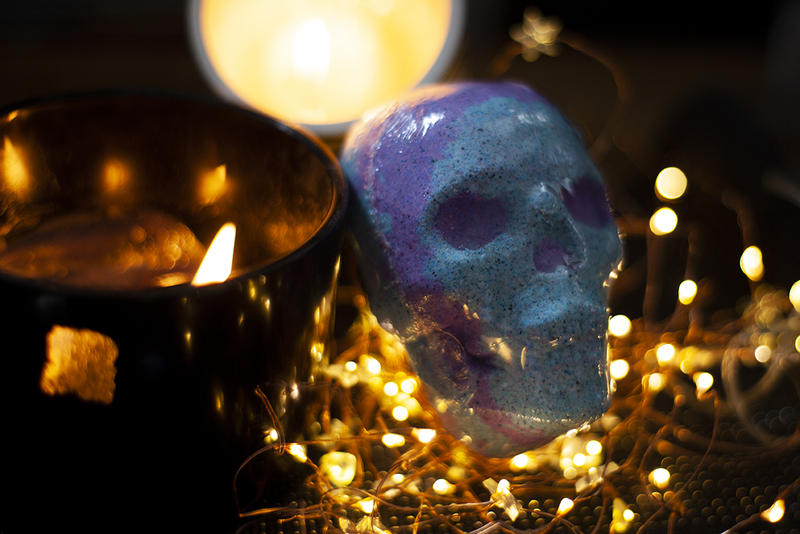 The Skull Bath Bomb (£3.95) is another Halloween exclusive, and comes in four different scents. I had the blue and purple variant which was a stunning blueberry cheesecake fragrance, but it also came in alien, mango and strawberry options too. 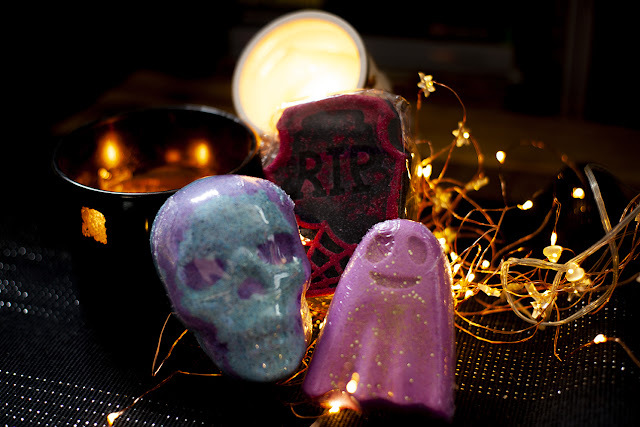 This bath bomb is a little bit larger than the ghost, and if you want to make them go further, would easily break into into two chunks for two baths. It makes a great, almost firework like display if you lower the skull in slowly in your hand, with the eyes popping and fizzing in true Halloween style. 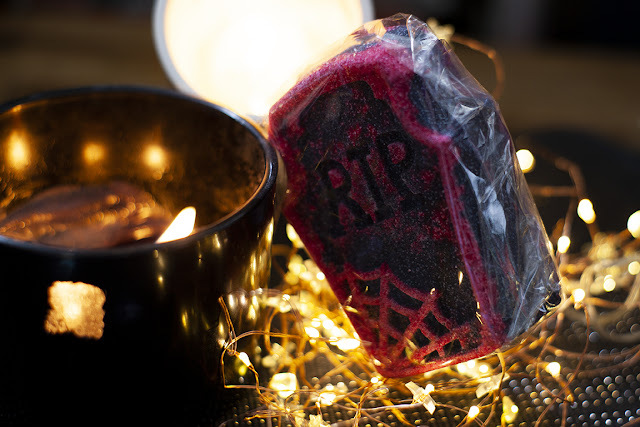 The Tombstone Bath Bomb (£4.50) is a beast of a bath bomb weighing in at a whopping 200g. Whilst the designs are all varied, they all come scented with lavender, vanilla and raspberry. It's such a generous size that you could easily stretch it across several baths if desired, although it has a wonderful effect when being gently lowered into the tub. If like me, baths are for all times, not just for Halloween, then you might also want to check out their Soap Box subscription service too. These are so cute! I'm bookmarking there Halloween collection, I might have to treat myself! The scents are right up my street. Although I do currently have far too many bathbombs sitting unused. These look anscomg! I love s bath bomb & I love Halloween.